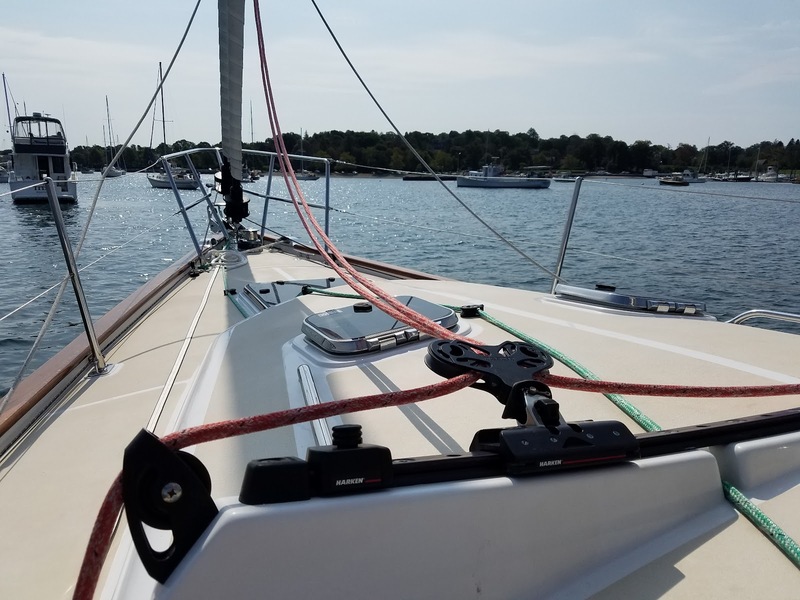 We had always considered a self-tacking jib to be a bit of a sissy feature as we've always had "real" rigs with jib tracks that required lots of winch grinding when tacking. Sail Shape: When sailing very far off the wind, the shape of the jib is really not so great. This is normally not that big of a deal because this is when we would deploy the "reacher" (our 150% genoa) which is sheeted from good old fashioned tracks and cars. Heaving To: It is a bit tricky to "heave to". Since you want the jib on the "wrong side", and with this rig, it always goes to the "right side". 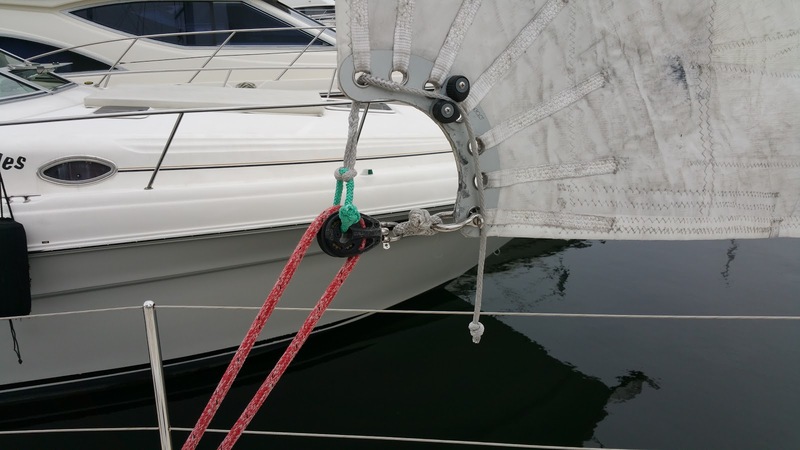 We mitigate this by having pinned stops on the traveler so we can pin the sail to one side of the boat or the other. But, it does mean going up on deck to do this and generally when needing to heave to, the conditions are not exactly safe for deck work. 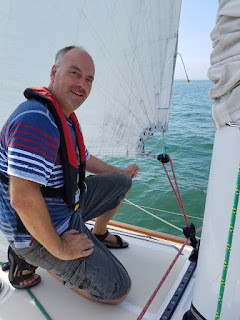 Sheeting Angle: In a traditional setup, you can move a fairlead forward or aft to adjust the angle at which the sail is sheeted, This critical adjustment tweaks the twist of the sail - the idea of which is to keep an optimal angle to the wind at all elevations of the sail (wind speed is usually higher aloft and so the apparent wind angle is different). In those setups, if you move the car forward, you're pulling more "down" which tightens the leech and spills less aloft. Move the car back and you're pulling more "back" along the foot and letting more wind spill aloft. In our self-tacking setup, the only adjustment for this is a series of holes on the clewboard which offer different attachment points for the sheet. Choosing a lower hole is like moving your jib car aft, while choosing an upper hole is like moving it forward. As for #3 above, the trick with this rig is to guess ahead of time which hole to attach the sheet to based on the conditions. This is of course fraught with error, and we often find ourselves sailing with way too much or way too little twist and are either way under or over powered. Argon's self-tacking jib traveler with car pins. Can you adjust it while sailing? Well, yes but it's a pain. I've manged to do it in light air while sailing by attaching a "temporary sheet" (our boom preventor) while I un- and re-attach the clew. In higher wind conditions, the only way is to furl in the sail to completely unload, and do it then. In either case, it's only a matter of time before we drop a critical pin or shackle overboard in the process. Well, not much. I've searched quite a bit to see if anyone makes any sort of contraption to make adjusting the sheeting angle underway easier. I thought for sure that like most boat problems, solving this would mean just typing in a credit card number. In this case, I really could not find anything. (I look forward to the comments to this post that will surely include about 17 off-the-shelf solutions). A couple times over the summer, I tried to design some sort of continuous adjustment scheme using various blocks, lines and cleats. I even bought a $92 block/cleat combo to experiment with. I was careful not to remove it from the shelf card so I could return it if if didn't work. I ended up returning it. The main thing I didn't like was that I just ended up with lots of dangling hardware flinging around behind the sail. Then, last week I was looking at this again and it occurred to me that there was lots of room on this big fat strong aluminum clewboard to mount a cam cleat directly to it. I started fooling around with some soft shackles and other pieces of dyneema I had laying around and came up with something much simpler. So, here it is. The main attachment point is made with a soft shackle (the gray one) between the block shackle and the main shackle on the clewboard. It is attached to the lowest (max twist/max spillage) position. Another soft shackle (green) goes through the block and a dyneema line with a Brummel Splice attached to that up through the highest hole and is cleated by a cam cleat mounted right on the clewboard. The cam cleat is through-bolted with some 10-24 screws with nylock nuts. I used tef-gel all over everything since it would be stainless and aluminum sandwiched together. The prototype adjusted about half way. Two soft shackles, a Brummel Splice and the cleat. By pulling down on that adjustment line, the block is raised which give the same sheeting angle as if we moved the main attachment to the upper holes. Now, time to test out the contraption under sail. We did not get a chance to test this out until Day 1 of the cruise. It worked great as far as adjusting the sail, but I did learn a few things to inform the next version. It is still not possible to adjust the angle higher when the sail is really loaded up. But it was very easy to do during tacking or by just turning the boat up into the wind enough to let it luff a little. No big deal. I actually got way more adjustment than I needed. When the sail is sheeted in tight, the distance to the traveler is very short (like 1 foot) so very tiny changes in this make a big difference in angle. Because of that, the soft shackle between the block and the main attachment point at the bottom is not even needed. Part of the design of this is that should the adjuster fail, I wanted the sail to revert to it's lowest (max twist) position so that the sail would be de-powered. Well, we got to test that pretty soon. The adjustment line is 5/16" dyneema and while that is certainly strong enough, it is not quite fat enough to stay securely in the cleat. With the winds at about 11kts, the cleat suddenly let loose of the adjustment line. It made quite a racket, but unlike many unexpected sailboat noises, we both knew exactly what it was immediately. This was also a great test of the fail-safe design which let the sail resolve to it's lowest attachment angle and de-power. The other thing that became very apparent, is that when adjusted up say to 50%, this adjustment line is carrying half of the sheet tension. On Day 2, we were running mostly on a broad reach down Buzzards Bay (thanks to remnants of Hermine) using the genoa, so I pulled the whole rig back into the cockpit to rework. The main changes I made were to lose both soft shackles. The block would now attach directly to the sail like it always did. And the adjustment line would now be 1/2" dyneema line Brummel Spliced directly to the block. I buried the tail of the splice almost to the end of the adjuster so it is a nice big fat line now that goes through the cleat. The adjustment line also tucks back through another hole in the clew so it comes out on the port side. This helps sink the line into the cleat better. Working on the revised version while under sail in the uncharacteristically flat Buzzards Bay. Making the splice for the upgraded version. Now with the new, thicker adjustment line spliced into the block. On Day 3, we found ourselves sailing high down buzzards bay (wind direction more back to the normal W/SW). The air was light, so this was exactly the conditions to try it on. Close-up of the clew with V1.5 sailing close-reaching in about 9kts with the sheeting angle adjusted up. The bigger picture of the adjuster in action. The only thing left is to use my hot knife on the cut end of the adjuster. I will do that next time we can plug into shore power! And to test again in light, mid and high winds.